The Wakid is a traditional basket used by tribes in Borneo such as Kadazan/Dusun/Murut and others to collect agriculture and hunting products. The wakid is normally hand-made of bamboo split with rattan weaving. Sizes range from 2' to 3' high and today they are replicated in small sizes (3" to 6") for decoration and gifts. Without the strap, it can be used as a corner stand lamp for bedroom, living room and foyer. 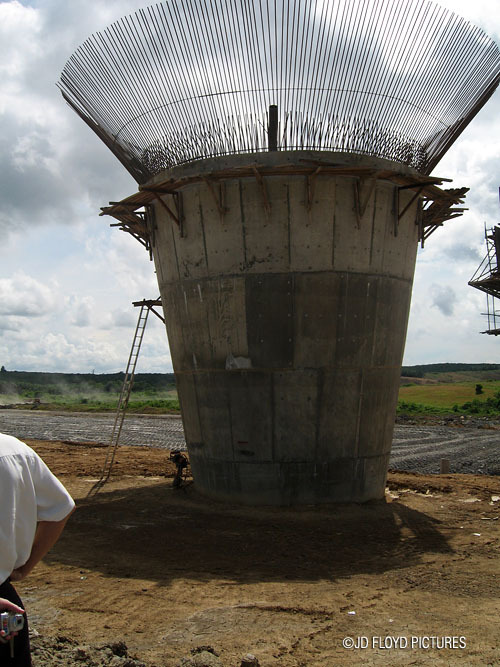 The one in this picture is a concrete water intake structure (resembling a Wakid) for a dam supplying raw water to a nearby Water Treatment Plant in Garinonoh, Sandakan Sabah. It stands at a massive 40 feet and could be more after its final completion. Hey did u know Sabah Art Gallery Conservation Centre actually reflects the shape of wakid? @Lena Astray - yes it does reflect the Wakid & with its design inspired by the tourism minister Datuk Masidi Manjun, a Dusun himself. @Anon - That is not a replica. It's a 'working' structure for a water dam near Segaliud River in Sandakan. The headgear in Penampang is called Sigah, it's in Donggongon town.